It seems that Kanye's attempts to jazz up Kim Kardashian's image haven't ended just yet. The rapper has managed to get her to swap her favourite Louboutins for trainers. 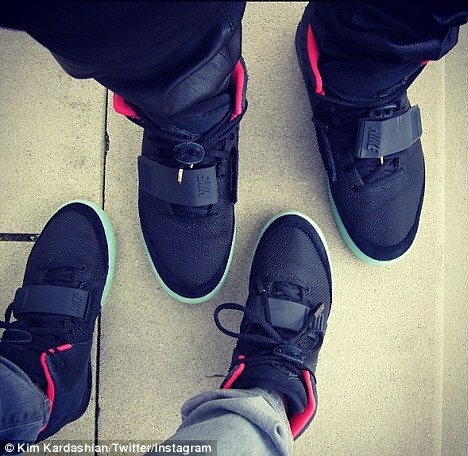 The new couple - who have been dubbed 'Kimye' - are both seen wearing the Nike Air Yeezys. Being so close to Kanye obviously has its perks - as the highly sought after shoes which are on sale now at a cost of $245 - are like gold dust. The Air Yeezy was released in stores across the US and several other countries on June 9, to shoppers who'd camped outside stores for up to a week. One Colorado man was in line at a Detroit store for five days, asking his mother to hold his place so he could take showers. Inspired by basketball shoes from the late eighties, the shoes were fetching pre release prices between $6,000 and $89,000 on eBay. Kim was photographed arriving at the gym this morning in Los Angeles in figure hugging exercise gear and bright green trainers. As usual, the tight ensemble flattered her famous curves as she headed for her daily calorie-busting workout. 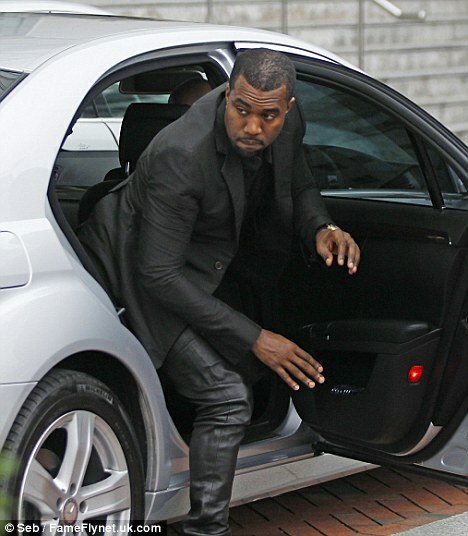 Kanye, meanwhile, is currently on the European leg of his Watch The Throne tour, making his most recent stop in Manchester in the UK yesterday. He was pictured yesterday in a jet black outfit that made him look every bit the quintessential rapper as he arrived at his hotel. Kim's casual outfit was in stark contrast to the leather dress she was spotted wearing as she arrived in Santa Monica for a business meeting yesterday. She is also set to start divorce proceedings later this month with estranged husband Kris Humphries. It was recently revealed by Radar that both parties are happy for their depositions not to be filmed, but Kris is said to be keen for cameras to roll then the divorce goes to trial in a courtroom. 'Both parties mutually agreed that it wasn't necessary,' a source told the website. 'There was concern about the depositions being filmed and then getting leaked to the media.